Atal Amrit Abhiyan Society, Assam a Society notified by the Govt. of Assam and registered under the Societies Registration Act, 1860 for implementation of Pradhan Mantri Jan ArogyaYojana and Atal Amrit Abhiyan ,two unique Health Assurance Schemes in the State of Assam aimed to provide health care coverage to Low Income households. For implementation of the above two Schemes, Atal Amrit Abhiyan Society, Assam invites applications for the following vacancies. The same is in addition to the Advertisement No. 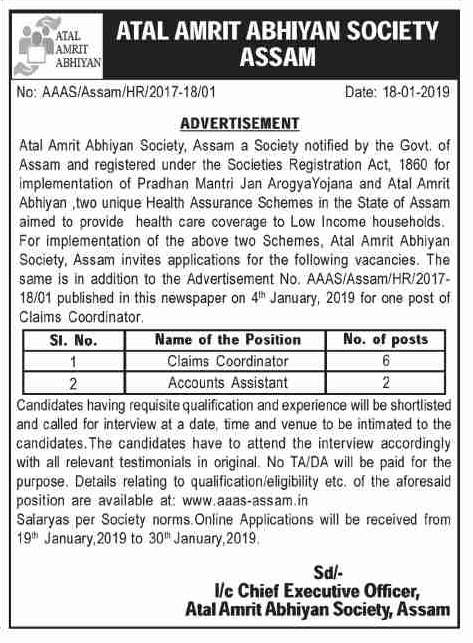 AAAS/Assam/HRI2017- 18/01 published in this newspaper on 4th January, 2019 for one post of Claims Coordinator. Pay: salaries as per Society norms. How to apply: Candidates having requisite qualification and experience will be shortlisted and called for interview at a date, time and venue to be intimated to the candidates.The candidates have to attend the interview accordingly with all relevant testimonials in original. No TA/DA will be paid for the purpose. Details relating to qualification/eligibility etc. of the aforesaid position are available at: www.aaas-assam.in .Online Applications will be received from 19th January,2019 to 30th January,2019 .